Gone are the days when the garage was used for – well, you know – the car. Today, it’s the loving home of tools, household items, bikes, ladders, and everything in between. You’ve probably thought about organizing your garage before just to get hit by the hard truth; it’s far easier said than done. Organizing the garage isn’t a one-size-fits-all kind of endeavor after all. Don’t throw in the towel and get discouraged yet, as storage solutions that will help you get your garage neatly organized within hours do exist. It’s just that you haven’t found them yet, but we did, and we brought them to you in this article. Wall-mounted hoists are an excellent, convenient solution that will allow you to store anything with ease. They come in different shapes and types to cater to different preferences. Take a look at the categories, and you’ll find manual-, electrical-, chain-, and rope- operated wall mounted hoists. Using such a solution, you can easily lift anything, be it a bicycle, kayak, or canoe off the ground to leave some room for the rest of your equipment and tools. When should I use a hoist? You might be asking yourself. Well, if you have a tiny garage that barely fits your car and you’re an occasional biker or kayaker, a hoist, either a wall-mounted or a ceiling one, is the way to go. Hoists are an elegant and space-saving solution that can keep different types of equipment safely stored above the ground whenever you need them without affecting the floor space. What’s a storage system without a cabinet (or ten of them), right? Let’s face it; the garage is basically the damp for all of your home improvement projects and off-season gear and equipment. Thankfully, you don’t have to keep everything scattered all over the place. Just invest in some garage cabinets, and you’ll be able to organize every item you have within minutes. Shelving the garage is also a great option to consider as that’s an easy way to store all of your auto lubricants, fuel, and other items without sacrificing the floor space. Shelves can be mounted anywhere, including the corner of the garage, which makes them what you’d call a one-size-fits-all kind of solution. Bulky items, such as heavy gear, bikes, canoes, and kayaks, can be a real pain in the neck in terms of storage as they take up too much space. What’s worse is that you can’t simply store them in other parts of the house, such as the basement, as taking them out would be an even bigger pain that way. That’s where overhead storage solutions come in to save the day. In this category, there are mainly two options that can do the heavy lifting (literally) and take care of your storage problems: ceiling hoists, and storage racks. Ceiling hoists are pretty similar to wall-mounted models, but they’re aimed towards heavier, bulkier items, such as kayaks and canoes, rather than small equipment, such as bicycles. You can even use a ceiling hoist to store your car’s roof when it’s not in use. When choosing a ceiling hoist for your garage, there are several factors that you should take into consideration. Make sure your garage is high enough to fit both your car and your loaded hoist. When calculating the clearance under a hoisted load, remember to factor at least a foot of space to accommodate the hoist and sag. Choose a hoist that can fit the layout and structure of your garage. Certain designs can be quite limiting, such garages with a single roof beam. In that case, for example, your best bet is to opt for a hoist with a two-point mounting system since both installation points would go into the beam. Determine how much effort you want to put into hoisting your equipment — a hoist consists or straps or ropes along with one or more pulleys. The pully system can be either manual or electrical. Obviously, electric models would be easier to use, but they’re also more expensive. Ceiling racks are by far the most practical storage solution for the garage. They can easily eliminate clutter and make your garage look neatly organized. Not only can they be used to store bulk items, but you can also arrange them even further using bins and containers. Furthermore, you can easily hang different kinds of gear, such as bikes, on them. What else could you ask for in a storage solution, right? Before opting for any ceiling rack, remember to take proper measurements of your garage to make sure the product you get will fit nicely there. Overhead storage solutions aren’t limited to ceiling hoists and racks, as there are other options that you can use. Cargo nets, for once, as great for oddly-shaped equipment or seasonal décor. Claw-style bike hooks can also be used to mount your bicycle with ease. If you need to store narrow sporting equipment, such as paddleboards and kayaks, but can’t use a hoist, you can always hang slings from the ceiling and store them there. The possibilities are endless. The garage is every house owner’s workshop and crafting space, which is why it’s only natural to have all your tools there. You can’t keep them scattered all over the place though, as not only do they take up too much space, but they’ll also be prone to breaking that way. The solution? Getting a tool chest, of course. Unlike standard tool boxes, tool chests offer more storage space and are far better in terms of organization. 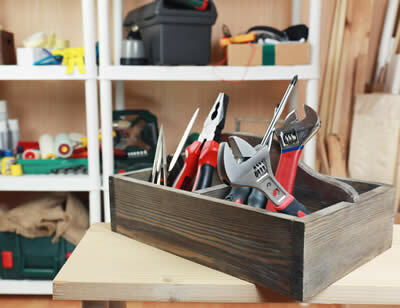 It’s easy to see why considering that they come with several drawers and cabinets in which you can neatly store your tools and categorize them as you deem suitable. Besides, tool chests usually come with wheels, which means that you can easily move them around whenever you feel like revamping your garage’s décor. Tool chests come in three main models: cabinets, chests, and mobile workbenches. Cabinets offer plenty of room for all of your equipment, making them the best option for heavy storage needs, but they can’t be moved around quickly. Mobile workbenches are similar to cabinets, but with a lighter, slimmer profile, which is why they offer more mobility and can be maneuvered around the workplace, aka the garage. Standard tool chests provide a middle ground solution, as they can be fixed or moved around easily, and they can even fit under a stationary cabinet. Just like any other part of your home, the garage deserves to be neatly organized all the time. Storing all of your items can be done using the storage solutions we detailed above, so it’s time to roll up your sleeves and start organizing!